You could buy chicken wings from your favorite wing spot in town or you could do yourself (and your wallet) a favor and make them yourself. Not only will you save money by making your own wings, you can also control the ingredients and how they’re made! This is great news if you’re trying to avoid added sugars and certain types of oils, or if you have specific dietary needs. For instance, this Whole30 chicken wing recipe is one of my absolute favorites if I’m doing a round of Whole30! All of the chicken wing recipes on All the Healthy Things are baked not fried because here’s a secret - you actually don’t need a deep fryer to get crispy chicken wings. All you need is an oven, sheet pan, and a little oil for the perfect wing. This recipe for Sweet and Sticky Raspberry Chicken Wings is no different. These wings are full of flavor but still made with healthy real food ingredients so you won’t feel sluggish after eating them. Because who wants that? Absolutely no one, that’s who. The base of this sweet and sticky raspberry sauce is one of my favorite real food ingredients - coconut aminos. Coconut aminos are a replacement for soy sauce that I use in many of my Asian recipes. Not only are they a great replacement for soy sauce, they also have a sweeter and less salty flavor than soy sauce which make them perfect for recipes like this. You can drizzle them over fried rice for a little umami flavor, dip your sushi in them, or cook with them. When coconut aminos are reduced they can create a sticky sauce that is perfect for coating wings and doesn’t require any added sugar. 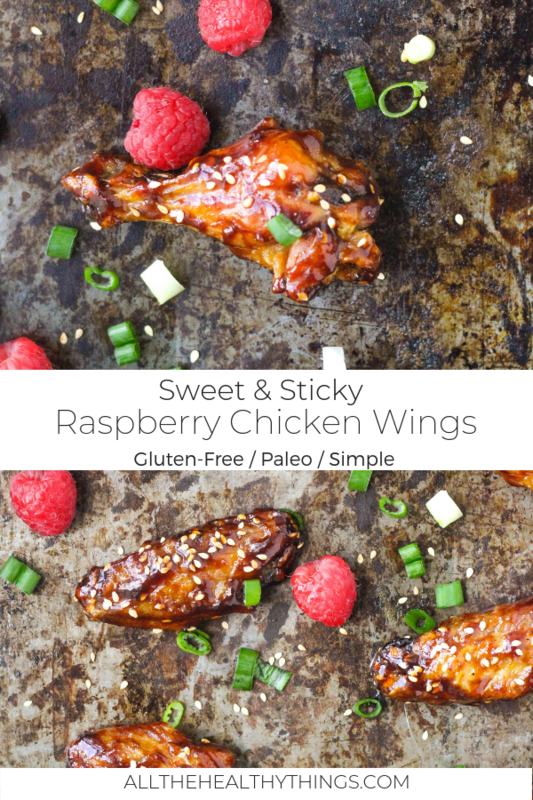 In addition to the coconut aminos, the sweet and sticky sauce for these wings contains fruity raspberry jam for a unique flavor twist. It may seem like an unlikely ingredient, but I can guarantee that the sauce is absolutely delicious and will leave you wanting more! Ok, so we’ve talked about the sauce but let’s talk about how to get the perfect crispy chicken wing WITHOUT deep frying. The trick to the perfect crispy baked chicken wing is to cook them long enough and at the right temperature. Chicken wings have a healthy amount of fat on them from the skin, so they can withstand a good amount of time in the oven without becoming dry. Cooking your chicken wings at 425 degrees for around 40 minutes, flipping halfway through, should give you the crispy results that you’re longing for without having to pull out a deep fryer. Another trick is to make sure that the wings are not over crowded on your sheet pan. It’s important to make sure that the chicken wings are placed on your baking sheet in an even layer and not too close to each other. Evenly spacing out the chicken wings will ensure that they don't steam and become crispy instead. I recommend using a large sheet pan to ensure your chicken wings cook evenly and get crispy. Once your chicken wings are fully cooked and crispy and your sauce is thick and sticky, all you have to do is combine the two for the perfect sweet and sticky chicken wing. Delicious! Preheat the oven to 425 degrees. Toss the chicken wings in the oil, salt, and garlic powder. Lay them in a single layer on a baking sheet and bake for 40-45 minutes, flipping halfway through, or until crispy. While the wings are cooking, make the sauce. Combine all of the remaining ingredients in a saucepan. Bring the sauce to a boil and then reduce the heat to a simmer. Let the sauce cook for 5-10 more minutes or until it's thickened and coats the back of spoon. Then, remove the sauce from the heat. When the wings are done, transfer them to a heat safe bowl and pour the sauce over the wings. Toss the wings in the sauce until each wing is well coated. Serve immediately and enjoy!